Boston and I absolutely love Thomas. I mean, c'mon now folks! You can't go wrong with a DVD collection that promotes imagination and life lessons that your child will keep for the rest of their lives - like helping others and working together. Since Boston is such a rockstar, our favorite is the "Sound Song Music Video" included in the Creaky Cranky disc. 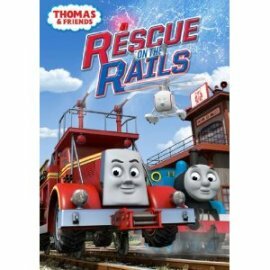 Sixteen fun-filled tales - including exclusive content never before seen on TV - take you once again to the Island of Sodor to ride along with Thomas and all his engine friends as they play in the rain, make special deliveries, work together and celebrate friendship and good fun. This classic DVD pack is geared toward children ages 2-5 and is approximately 192 minutes long. The good news? It's just $19.98! Purchase here. Have fun! Well lookie here! Your child's favorite engine along with his trusty co-engines! All aboard for an unforgettable holiday! When you ride the rails with your jolliest friends, you can expect exciting adventures filled with lucky trucks, surprise parties, adorable snowmen and much, much more. Join Thomas, Henry, Emily and Percy for trainloads of fun and festivities! Running time of 48 minutes. 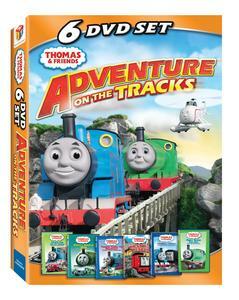 Bonus Features- Sodor Sounds Game and Cargo Challenge Game. Title Copyright: © 2011 HIT Entertainment Limited. Thomas the Tank Engine & Friends™ Based on The Railway Series by The Reverend W Awdry. Thomas the Tank Engine & Friends and Thomas & Friends are trademarks of Gullane (Thomas) Limited. 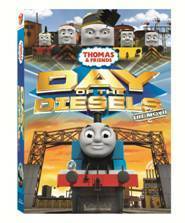 Thomas the Tank Engine & Friends and Design is Reg. U.S. Pat. & Tm. Off. The movie is about an hour & rating is NR. Thomas & Friends Merry Christmas, Thomas! Come ho-ho-home to the Island of Sodor and join Thomas and his engine friends for the holidays in Thomas &Friends™: Merry Christmas, Thomas! releasing on DVD, Digital Download and On Demand October 11, 2011 from Lionsgate and HIT Entertainment. 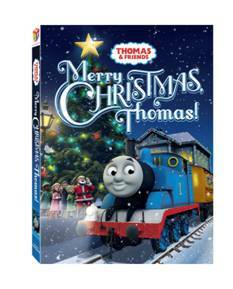 Join in the festive fun as Thomas, Percy, Gordon and the other engines pick out the best tree, get caught up in the snow and celebrate the holidays in this magical Christmas special. All aboard as Thomas & Friends continues to teach timeless life lessons such as discovery, friendship and cooperation, inviting children to enter a world of imagination through the tracks of a train and the words of a story. Thomas the Tank Engine was created by a father for his son over 65 years ago and today is enjoyed by families in more than 185 territories and in 30 languages. The #1 blue engine and his friends invite children to enter a world of imagination through the tracks of a train and the words of a story. Children embark on adventures with their engine friends while experiencing timeless life lessons of discovery, friendship and cooperation. Thomas & Friends is the Number One preschool toy property in the UK, a position it has held for the past 11 years. It remained the Number One preschool toy license in the US for 10 straight years[i] and has been the Number One preschool entertainment brand in the US since 2009[ii]. The unrivaled popularity of the global brand continues with Thomas also being the Number One preschool toy license in Germany and Australia, as well as the Number One foreign preschool brand in China, Japan and Korea. (SOURCE: AC Nielsen, 1/1/10-12/31/10). Each DVD release is consistently ranked in the Top 10 new releases for Children’s Non-Theatrical (source Nielsen) and many have received significant awards and recognition from organizations such as Parents’ Choice and KIDS FIRST! SYNOPSIS: A is for adventure with your favorite preschool friends! Jump on the learning track because Thomas, Barney, and all of their friends are waiting for you to join in the excitement. Create a dance-tastic school poster with Angelina Ballerina and then build a pirate ship with Bob the Builder. Don’t forget your rescue hat because Fireman Sam needs help saving the school bus. With these fun-filled adventures, discover that playtime can be learning time for the whole family!